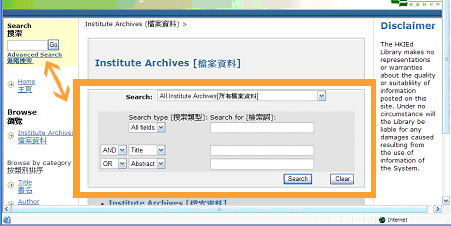 The EdUHK Collection [教大特藏] is a collection set up for long-term preservation and effective dissemination of EdUHK-related materials in digital formats. All documents, including those originated by EdUHK staff and students, are processed with copyright clearance. It consists of EdUHK Publications including programmes prospectus & handbooks, university publications, staff publications, student publications, curriculum materials and internal documents. Due to copyright reasons, materials in the EdUHK Collection, with the exception of 'Programme prospectus & handbooks' and 'University publications' are accessible by EdUHK staff and students only. The search box is at the left hand top corner of the search platform for all document type. Enter keyword(s) into the search box, then press "Go" button. (a) Click on the "Advanced Search" hyperlink on the left hand side or (b) enter the keywords directly in the middle part of the homepage. From the search result, click on "View/Open hyperlink" to view full text document. Note that the URL of the record is sent to the supplied email address, not the full document. 1. Click on "Recommend/Email this item"
2. Fill in both sender's and recipient's name and email addresses, then press "Send"
AND teaching AND learning BOTH the words "teaching" and "learning"
OR teaching OR learning EITHER the words "teaching" or "learning"
NOT teaching NOT learning "teaching' but not "learning"
profess* keywords which begin with profess, such as professor, professors, profession, professionalism, etc. Put a plus (+) sign before a word if it MUST appear in the search result. For instance, in the following search the word "enrichment" is optional, but the word "language" must be in the result. Put a minus (-) sign before a word if it should not appear in the search results. Alternatively, you can use NOT. This can limit your search to eliminate unwanted hits. f. Parentheses can be used in the search query to group search terms into sets, and operators can then be applied to the whole set.